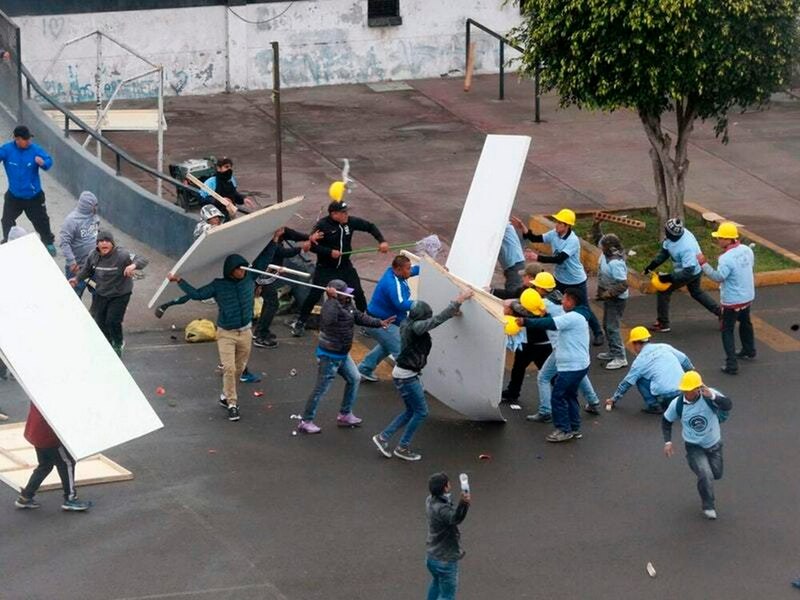 Police used tear gas to break up the confrontation in Lima. Peruvian police have been called in to break up clashes between football fans and members of an evangelical church in a dispute over who owns a sprawling plaza in front a stadium. Hundreds of members of the Upper Room church wearing yellow construction helmets arrived in buses and began painting walls, covering images of famed players from the Alianza Lima club. Football fans soon arrived and the two sides clashed. Police in the Peruvian capital used tear gas to break up the confrontation. Police Chief Gaston Rodriguez said two fans were detained and one of the church members was injured. The club said in a news release that it has owned the plaza for 40 years, but church lawyer Sandro Balbin said the church has been the registered owner of the property since 2016. It is now used for concerts, parking and a gathering place for fans. The Upper Room wants to hold worship services there.